Since the nineteenth century, the sitar has been one of the predominant instruments of Hindustani music. It is also used in film and other light music and in accompaniment to dance. Regional versions of the sitar are found in rural north India, and Pakistan. The sitar is currently one of the predominant concert instruments of Hindustani (North Indian classical) music. Some of the most influential pioneers of this instrument: Ustad Vilayat Khan, Pandit Ravi Shankar, Pandit Nikhil Banerjee, Enayat Khan, Imdad Khan, Abdul Halim Jaffar Khan and Mushtaq Ali Khan to name a few. Some of the popular sitarists today: Ustad Shahid Parvez Khan, Ustad Rais Khan, Ustad Imrat Khan, Ustad Nishat Khan, Ustad Shujaat Khan, Pandit Budhaditya Mukherjee, Hidayat Khan and Shakir Khan. The tabla is a popular Indian percussion instrument used in the classical, popular and religious music of the Indian subcontinent and in Hindustani classical music. The instrument consists of a pair of hand drums of contrasting sizes and timbres. 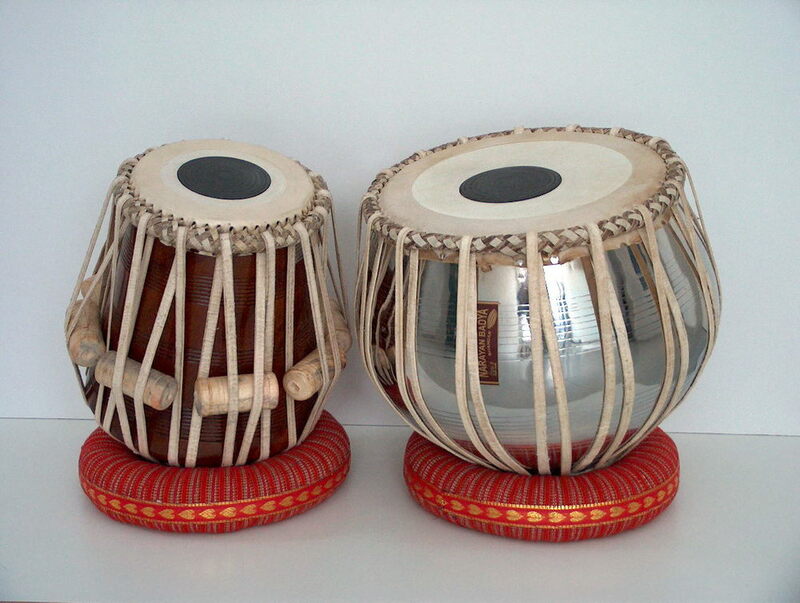 The term tabla is derived from an Arabic word which means "drum". The instrument enjoys a world wide popularity in terms of rhythm and percussion instruments. It is frequently heard in Hollywood and other popular genres of music such as fusion music. Some of the most influential pioneers of this instrument: Ustad Ahmedjan Thirakwa, Ustad Amir Hussain Khan, Pandit Ram Sahai, Pandit Anokhelal Mishra, Ustad Allah Rakha, Ustad Habibuddin Khan, Pandit Sampta Prasad, Pandit Kishan Maharaj and Ustad Zakir Hussain to name a few. Some of the popular tabla players today: Pandit Anindo Chatterjee, Pandit Swapan Chaudhuri, Pandit Kumar Bose, Akram Khan, Abdul Sattar Tari, Subhankar Banerjee and Abhijit Banerjee to name a few. The santoor is the oldest known string instrument of India which is used in Indian classical music. It is said that the santoor can be traced to the old scriptures called the Vedas in which it contained 100 strings of grass and was played with wooden sticks. In Sanskrit it is called the shata tantri veena or "a hundred-stringed lute" since it has 100 strings. Played with a pair of rounded mallets made from walnut wood, the santoor produces harmonious melodies that are similar to the music of the harp. The curved mallets sometimes called a mizrab that is lightweight and are held between the index and the middle finger. 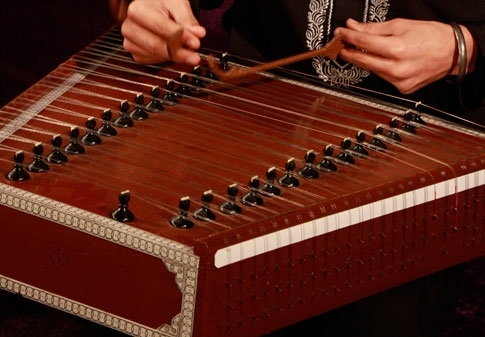 There is also a closely resembling instrument known as the Santur which is played currently in Iran. The santoor primarily was played as a folk instrument in Kasmir. Pandit Shivkumar Sharma and his family as well as Pandit Bhajan Sopori and his family contributed much to the advancement of the instrument and played a big role in bringing the instrument into the Indian classical music circuits around the world. Some of the popular Santoor players today: Pandit Shiv Kumar Sharma, Pandit Bhajan Sopori, Pandit Tarun Bhattacharya, Rahul Sharma and Abhay Sopori to name a few. One of the oldest musical instruments of India, the bansuri can be traced to Vedic period also known as the time period of Lord Krishna. It was also played in religious performances in the Buddha period. Structurally, the body of the bansuri which is also called a dandi is mainly made from bamboo or reeds. 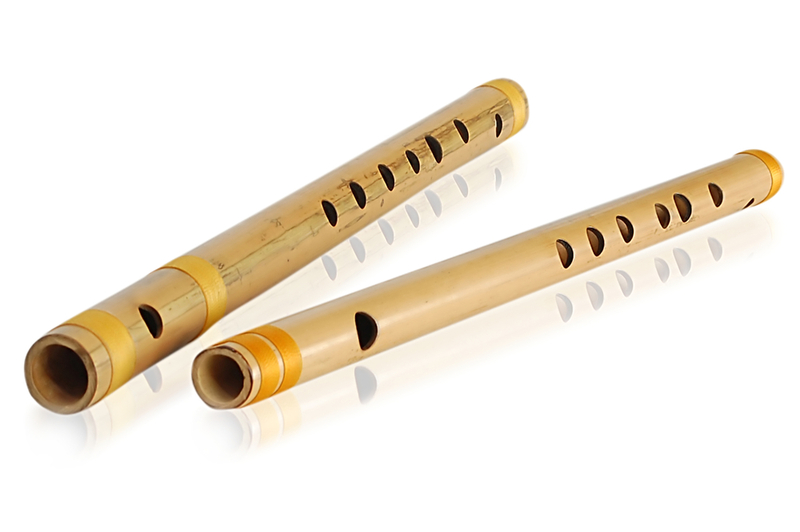 The two varieties of the bansuri are the traverse and the fipple. Since the traverse variety offers flexibility and control, it is strongly preferred in classical music. The fipple variety is often played in folk music and is held away from the lips. The instrument is widely popular in India and in many different genres. From Bollywood popular music to regional folk music as well as Indian classicla music in recent times. The hindu God, Kishan is often depicted playing a Bansuri and so the instrument is given huge religious significance in India. Pandit Pannalal Ghosh and Pandit Hariprasad Chaurasia are the two Bansuri players who had tremendous importance in bringing the instrument into the world of Indian classical music. Before them, it was largely found in Folk, popular and regional music. The sarod is a popular string instrument which originated from a rabab, an instrument which derived in the Middle East. The sarod is hand carved from a single block of Indian mahogany also known as teak wood. It contains four playable or melody strings, two rhythm strings, four strings that tuned to the dominant note of the raga, and the 15 remaining strings are sympathetic vibrating strings. 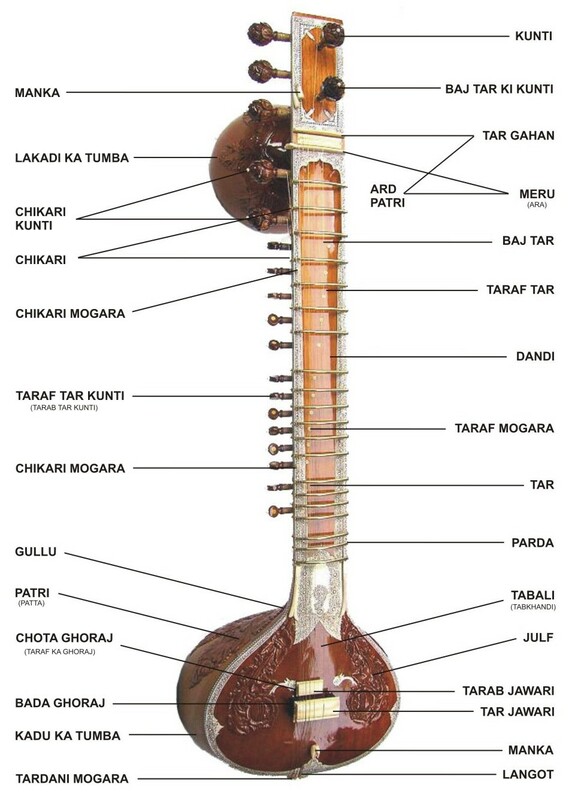 The sarod is a very important instrument in the sphere of Indian classical music today and although it has always been primarily a classical instrument it has been used substantially in Bollywood films and soundtacks as well as is highly used in Ghazal recordings. Some of the most influential pioneers of this instrument: Ustad Hafiz Ali Khan, Ustad Allaudin Khan, Ustad Abdhullah Khan, Ustad Ghulam Ali Bangash and Ustad Mohammad Amir Khan to name a few. Some of the popular Sarod players today: Ustad Ali Akbar Khan, Ustad Amjad Ali Khan, Ustad Ashish Khan, Pandit Radhika Mohan Maitra and Pandit Budhadev Das Gupta to name a few. 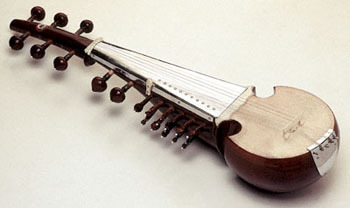 The Sarangi is the foremost stringed instrument in North India used in traditional classical singing. It began to become popular in the mid-17th century to accompany vocal music. Carved from a single block of hardwood also called Indian cedar, the sarangi ranges usually from around two feet long to half a foot wide. It has 3 playable strings made comparatively heavy. 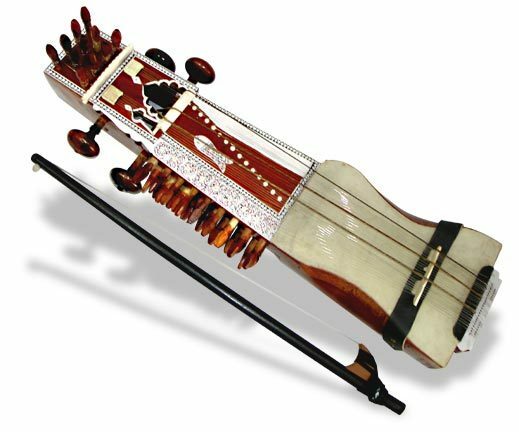 In addition, the sarangi consist of 35 sympathetic stings which gives the vibrating sound. The sympathetic strings are usually made of brass or steel and are tuned according to the scale of the raga. The sarangi is used for Folk music, especially in Rajasthan. It has been known as a very effective instrument in supporting vocalists. Although known for its use in these genres, it has become a staple in Indian classical music recitals across the world due in large to the efforts of Ustad Sultan Khan and Pandit Ram Narayan. Some of the most influential pioneers of this instrument: Ustad Hyder Bakhsh, Ustad Mamman Khan, Ustad Nathu Khan, Ustad Shakoor Khan, Ustad Sagiruddin Khan, Pandit Gopal Mishra, Ustad Sultan Khan and Pandit Ram Narayan to name a few. The harmonium is considered to be one of the most prevailing instruments in Indian music, mainly used for accompanying vocalists. This astounding instrument was first introduced by the French during the mid-19th century when the missionaries came to India. The harmonium quickly became well-known throughout India, since it was very simple to learn and very easy to acquire. Although the design of the harmonium was quite clearly from the French, the harmonium was further developed in India by the addition of a scale changer and drone stops. 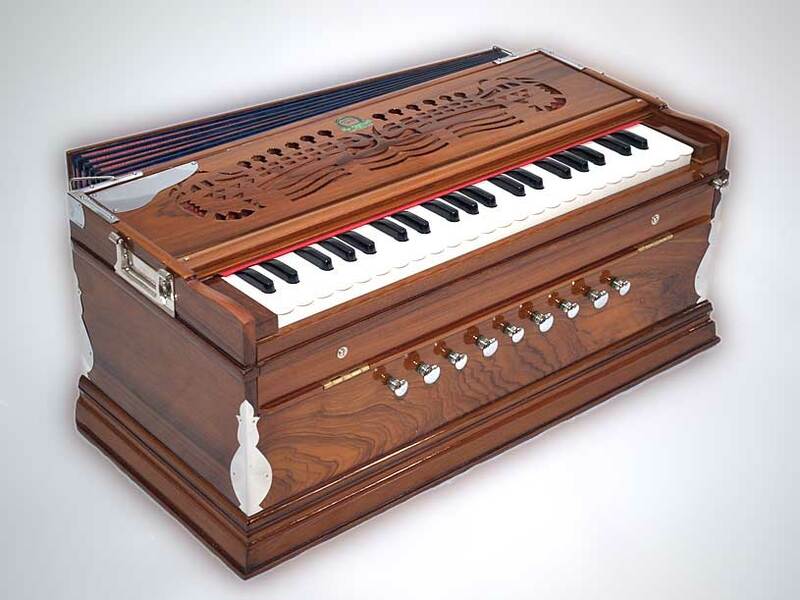 The Indian version of the harmonium was adapted for the needs of Indian music and is vastly different from its pump-organ origins. It is played widely is the most popular accompaniment instrument by far in the Indian sub-continent today. Interested in learning Indian Classical Music? Please visit www.aimfa.org for more information. Do you have an instrument in need of repair? Please visit www.aimfa.org/resources for more information.